DDAA experiments with differents sorts of Plasma in the musical universe. “Concert Plasmatique” is a mix of several periods where the members develop a throbbing improvisation around some of their songs. The Plasma music is a material as the medium for a painter. The first part (30 min.) is a screening of videos from 1984 to 2010. The second part (90 min.) is a continuation with film and concert. A space for all Plasmatic people. 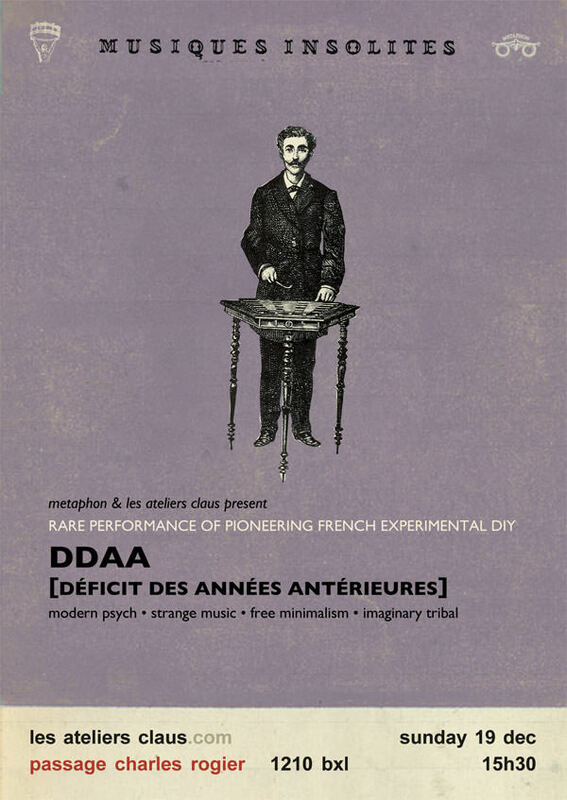 DDAA is an obscure group of radical experimental noise makers using improvisation and collage to craft strange sounds and deconstructed songs for highly creative music that is as far off the path of conventions as that of similar but more known visionaries like the Residents and Nurse With Wound. In fact, DDAA roughly began the same time as NWW in the late ’70s, started by three visual artists, Sylvie Fee, Jean-Philippe Fee, and Jean-Luc Andre in Normandie, France. The multi-talented trio originally formed Illusion Productions to create plastic sculpture and other various artistic pursuits and DDAA became the musical arm of Illusion. Déficits des Années Antérieures, their full name, translates roughly in English as “last year’s deficit,” though perhaps more appropriate is the fact that their initials are an anagram of Dada, that pre-Surrealism art movement at the time of World War I. As none of the three were trained musicians, their music had a distinct naïve quality of outsider art and with few noticeable influences, exists on a plane of its own. Like others whose music is too uncompromisingly different to become commercial, DDAA began releasing recordings under the umbrella of Illusion Productions, starting with a 7″ 45, Miss Vandam, in 1979. Research into various traditional ethnic music resulted in the EP Adventures in Africa in 1981 and the LP Action & Japanese Demonstration the next year, with hand-painted covers and elaborate packaging and inserts. Bernard C joined the lineup to play on the 1984 album Les Ambulants and continued on and off with them until the early ’90s. Throughout the ’80s and ’90s, the group continued to put out records and tapes, as well as perform, and even exhibit artwork in various galleries in Paris and Nice. Starting with the 1992 CD Nouveaux Bouinages Sonores (Dans la Période), DDAA has further enhanced its pursuit of strange sounds with the invention of an imaginary culture, the Maracayace, a theme explored more fully on the three-CD Baggersee and the full-length La Conference Maracayace, as well as live shows. DDAA continues to forge on in the new millennium with its highly creative artistic vision.